Resilient industrial gem that offers above-average yields of 7.4%-7.6% over FY19F-21F. Extraction of value from greenfield projects and addition of 600,000 sqft of untapped GFA could drive revenues by 16%. Potential takeover target amid global hunt for quality assets. 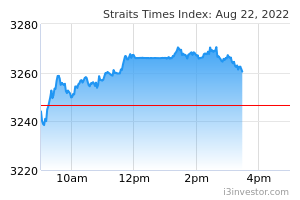 Initiate with BUY and Target Price of S$1.55; addition of untapped GFA could raise fair value to S$1.65 or more. Supported by master leases with built-in rental escalations, AA REIT offers investors a higher degree of income certainty ahead of the sector’s anticipated recovery in 2020 with attractive dividend yields of 7.4%-7.6% p.a. over FY19F-21F. AIMS AMP Capital Industrial REIT (AA REIT) is unique for its 600,000 sqft of untapped gross floor area (GFA) - one of the highest amongst peers. Given the prime location of selected properties, we believe that the Manager can potentially redevelop these sites into future-proof assets, such as data centres (if feasible). We estimate the unlocking of unutilised GFA could lift its proforma FY18 revenue and NAV by 15.8% and 7.9%, respectively. Including untapped GFA, AA REIT’s implied yield (NPI/EV) of 6.4% would place them at the upper end of its peer range of 5.1%-6.6%. Initiate with BUY and DCF-based Target Price of S$1.55, based on WACC of 6.6% and terminal growth rate of 1.5%. The redevelopment of AA REIT’s underutilised sites could raise its fair value to S$1.65. Resilient S-REIT with strategically located properties and proven track record. AIMS AMP Capital Industrial REIT (AA REIT), previously known as Macarthur Cook Industrial REIT, has demonstrated resilience through property cycles and offers a solid growth track record. Since its listing in April 2007, AA REIT has more than doubled its initial portfolio of 12 Singapore industrial properties to 26 properties as of today, resulting in a five-fold increase in AUM over the last decade to S$1.45bn as at end-FY18. The enlarged portfolio comprises well-located industrial assets in established industrial hubs across Singapore (25) and Australia (1), with greater diversity in end-sectors. Despite its geographical diversification into Australia in FY14, AA REIT is still predominantly focused on the Singapore market, where untapped growth potential remains. Forayed into Australia through Optus Centre investment in 2014. While being predominantly focused on the Singapore industrial market, AA REIT has on occasion made selective acquisitions abroad – including Asahi Ohmiya Warehouse (Tokyo, Japan) which was sold above book value in Mar 2011 as part of a portfolio repositioning exercise. On 7 Feb 2014, AA REIT acquired a 49% indirect interest in Optus Centre, a premium business park located at Macquarie Park in Sydney’s north, for A$184.4m (or S$215m based on then AUD/SGD exchange rate of 1.1658). Supported by long leases to quality tenant Optus Administration Pty Limited, a wholly owned subsidiary of SingTel, into June 2021-2023, and fixed annual escalations of 3%, Optus Centre currently ranks among the trust’s key performing assets, and contributed 15.3% of portfolio value in FY18. Diversified asset exposure within the industrial space. While AA REIT’s initial portfolio consisted purely of traditional warehouse and manufacturing assets, selective acquisitions and ongoing asset recycling efforts have resulted in the REIT “upgrading” its portfolio in favour of business parks and high-specs sectors over time, which currently represents 28.4% of the portfolio’s appraised value and 19.8% of NLA, respectively. As of 31 Mar 2018, the Trust has 2 business park assets (1A International Business Park and Optus Centre) and a high-tech property (29 Woodlands Industrial Park E1) which was acquired in Feb 2011. Supported by high occupancies of over 90% (partly due to master leases for business park assets) and rental escalations of between 1% and 3% p.a., distributions have remained robust over the last few years despite the challenging operating environment. This resulted in stable valuations over time. As at 31 Mar 2018, 84.7% and 88% of AA REIT’s valuation and NLA, respectively, were derived from its 25 properties in Singapore. The remaining valuation of 15.3%and NLA of 12% stem from the Trust’s sole asset in Australia, Optus Centre. Extending land lease tenures by diversifying outside of Singapore. Assuming the freehold Optus Centre has a 99-year leasehold interest, we would arrive at a land lease expiry of 37.3 years (on NLA basis) for AA REIT. While being slightly above the median of 35.4 years among mid-cap peers, this is at the lower end of the peer range of 33.3 to 83.9 years – which reflects the Trust’s predominant exposure to the Singapore market, where land leases are typically structured on leasehold terms. Given the current trend by the Singapore government to sell industrial land with shorter leases of 30 years (vs 60 years previously), S-REITs have been looking towards overseas markets to gain access to freehold assets. AA REIT has however focused on upgrading its portfolio through redevelopments. Over the medium term, we believe that AA REIT could embark on a similar strategy to complement its organic growth plans and given the support and access to opportunities from its Sponsor AIMS and AMP Capital, the ability to scale up is there if the REIT chooses to head overseas for growth. That said, the Manager feels this to be a medium-term strategy as the REIT’s near-term focus will primarily be centred on upgrading its core Singapore portfolio in order to “future proof” the properties to changing tenant needs. Improved tenant mix offering greater diversity in end-sectors. We partly attribute the stability of AA REIT’s financial performance to its broad tenant mix and diversity in trade sectors. At last count, the REIT had 159 tenants across > 20 industries, vs 148 tenants from 15 industries a year ago. Tenant concentration risk has also fallen since IPO. In 4Q18, its top 10 tenants contributed 57.9% of GRI (vs 94.3% in Apr 2007) and includes well-established corporations such as Optus Administration Pty Limited, CWT Pte Limited, Illumina Singapore Pte Ltd and Broadcom Singapore Pte – which are the leading players in their respective fields. However, we note that AA REIT’s exposure to CWT Ltd is expected to come off gradually with the expiry of its master leases over the next few years. Portfolio occupancy lifted to 90.5%; lease structure offers stability ahead of the anticipated sector recovery. As at 31 Mar 2018, AA REIT portfolio occupancy improved sequentially to 90.5% from 88.4% in the previous quarter. This was mainly driven by a combination of higher tenancies across several facilities and disposal of 10 Soon Lee Road – where occupancies have averaged 72% over the past three years – on 29 March 2018, which more than offset the effects of 3 Tuas Ave 2 coming off its master lease ahead of its redevelopment in FY19F. Currently, nine out of AA REIT’s 25 properties are backed by master lease arrangements with staggered expiries in the coming years. In 4Q18, approximately 37.7% of gross rental income (GRI) was derived from master leases. Despite the challenging industry backdrop due to structural demand shifts and net oversupply conditions in recent years, AA REIT’s lease structure and diversified trade sector mix has helped to stabilise earnings and DPU. With built-in rental escalations providing a steady and visible growth profile, the master leases should continue to offer investors a higher degree of income certainty and visibility over the medium term. The well-spread master lease expiries and shorter WALE of 2.6 years (vs industry average of 3.5 years) also allows the Trust to better ride the anticipated recovery in industrial yields from 2019/2020. Based on our estimates in FY19F, AA REIT will likely derive 24% of its gross rental income (GRI) from master leased assets (excluding 20 Gul Way which is partially multi-tenanted), which provides stability to cash flows. AA REIT is sponsored by two Australian financial groups – AIMS Financial Group (AIMS) and AMP Capital. AIMS is a diversified financial services and investment group focused on mortgage lending, securitisation, investment banking, funds management, property investment, private equity, venture capital, stock broking and high-tech investment. The group is focused on the Asia Pacific region, with a direct presence in Australia, Singapore and China. Over the last two decades, AIMS has raised more than A$4bn from the capital market, issued A$3bn of residential mortgage-backed securities and originated over A$8bn of mortgages since 1991. AMP Capital ranks among the largest investment managers in the Asia Pacific region and is part of the AMP Group, which has a history of over 160 years. AMP Capital has over 50 years of experience in direct real estate investments (primarily in Australia) – one of the key pillars in its portfolio. Its team of > 500 real estate professionals collectively manage A$26 bn in AUM spanning a broad range of sub- sectors – including office, industrial, retail, and mixed use assets in prime locations. The Sponsors’ interests in AA REIT are aligned through a combined 17.01% stake in the REIT. 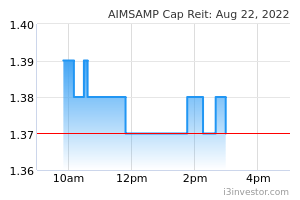 Of which, AMP Capital and AIMS hold 10.23% and 6.78% respectively. Poised to benefit from Sponsors’ network and expertise in Australia. Despite not having an asset injection pipeline from the Sponsors, we believe that AA REIT stands to benefit from their network and real estate expertise in Australia, which could give rise to more acquisitive opportunities in Australia – similar to the Optus Centre acquisition in FY14, going forward. The industrial market is bottoming out. We believe that the outlook for Singapore’s industrial sector will remain stable in the immediate term and has started to bottom out from 2018 onwards on the back of abating supply risk. Rental rates have seen a reversal from the downtrend in 2017 to a stable rental status, where rates are expected to increase by up to 3%. The recent recovery in the manufacturing sector is fuelling expectations that demand could potentially remain consistent in 2018 and bottom out in 2019, just as the total number of supply abates. However, the recovery is uneven as firms still look to consolidate or downsize their space requirements in order to remain cost efficient. Vacancy rates are expected to follow a downtrend from the 11% recorded in 2017 and beyond. As of 1Q18, the take-up for industrial space was lower than the drop-off in supply, with a net increase in occupied space of close to 0.2m square feet (sqft). It is expected that the majority of this space will be taken up progressively by end-user occupiers in the coming quarters, as seen in the previous quarter. We believe that demand for space comes on the back of consolidation of operations to achieve operational efficiency, which is one of the key drivers for space in the industrial sector. Hence, we expect the increased take-up in the single-user factory space to take place at the expense of higher vacancy rates emerging from existing multi-user factory space, which some of the end-users are expected to vacate. However, the take-up rate should start to pick up in 2018 if the expansion in manufacturing activities persists. Supply risk is tapering off from 2018-2019. The industrial market is at the tail end of a period of a spike in supply completions, starting from 2014 and peaking in 2017. As such, landlords are typically still facing an increasingly competitive operating environment, but that should start to abate in 2018 and 2019 when competition from new supply starts to drop. That said, we view that 2018 will be a year of stabilisation, given expectations that the hike in new supply in 2017 will need time to be absorbed. Based on the latest Jurong Town Corporation (JTC) statistics, a total of 4.5m square metres (sqm) – equivalent to 48.8m sqft – of new industrial space is either under construction or in planning and projected to complete over the next five years, from 2018 to 2022 and beyond. Of this, more than 30% of the space will be completed and operational by the end of 2018. Among industrial types, the single-user factory space will see close to 1.8m sqm increase in new supply representing an increase of 8%, the multi-user factory space will see close to 1.5m sqm of new supply (c.13% increase), followed by the warehouse space at 8% (or close to 0.9m sqm). The business park space will add another 0.4m sqm. However, most of the space is pre-committed and thus not an issue for existing landlords. Industrial sector’s overall vacancy rates to improve by 2018; with further decrease from 2019 onwards. Taking into account assumed pre-commitment rates and projected new demand, and faced with an increasing supply outlook, the average vacancy rate is now 11.0% (as of end-1Q18). However, we expect an improvement to 10.8% in 2018F and a further drop thereafter due to the drop in new supply. While AA REIT has the mandate to invest in high-quality income-producing industrial real estate throughout Asia Pacific, its asset portfolio is currently focused on the Singapore and Australian markets. The Trust is managed by AIMS AMP Capital Industrial REIT Management Limited (the ‘Manager’) – a joint venture REIT management company equally owned by the Sponsors. The Manager’s key investment objectives are to deliver secure and stable distributions and provide long-term capital growth to unitholders. This can be achieved through active asset-enhancement strategies, acquisition growth and capital-recycling activities, supported by prudent capital and risk management. Over the last decade, AA REIT has employed a variety of organic and inorganic growth strategies to drive portfolio value. Acquisition-led growth has been vital among mid-cap industrials struggling to grow organically (and domestically) due to lacklustre industry conditions. Against this, AA REIT stands out for its strategy to undertake redevelopments for its portfolio to upgrade property specifications, resulting in higher rents and capital value. Going forward, with over 500k of untapped GFA, we see the Trust’s untapped potential being realised through active portfolio repositioning and asset enhancements / redevelopments to maximise GFA. Trading at 6.2% discount to RNAV of S$1.48 and given the meaningful portfolio size, AA REIT could also be an attractive acquisition target for larger REITs or foreign funds looking to scale up or gain a foothold in the Singapore industrial REIT space. Optimising portfolio returns through selective divestments and recycling of capital. As part of its proactive asset management strategy, AA REIT constantly reviews its portfolio for efficiencies and seeks to identify gaps between secondary market values and underlying rent expectations, which have led to several value-accretive divestment opportunities previously. Capitalising on robust real estate secondary market values, AA REIT has made three divestments to date – all of which were transacted above book value, with divestment premiums of between 2.1% to 27.7%. Divestment proceeds provided the REIT with added financial flexibility and were often channelled towards paring down debt and financing acquisitions, asset-enhancement initiatives or development opportunities. We believe that this will remain a relevant strategy for the group going forward. Repositioning ahead for the future. Since FY12, AAREIT has taken active steps to future-proof its business by repositioning towards a higher-value portfolio which we believe will remain relevant to changing manufacturer needs. Given the supply-side challenges in the industrial space, we believe this allows AA REIT to better capture opportunities presented by tenants’ growing preference for quality spaces. AA REIT undertook its first redevelopment in July 2011 and has successfully redeveloped four of its existing properties into higher-spec facilities thus far. Combined, the redevelopment of these four sites brought on over 155,000 sqft of additional GFA and provided a substantial > 400% boost to asset values – from just S$77.4m prior to redevelopments to approximately S$419.8m post. Untapped GFA could boost NAV by 8% over the medium term. On 17 May 2018, AA REIT proposed the redevelopment of its 3 Tuas Avenue 2, which will transform the purpose-built production and warehouse facility into a modern and versatile ramp-up industrial facility suitable for both production and storage. Upon completion, the redevelopment will maximise the plot ratio of 1.40 and increase gross floor area by 52% from 175,821 sqft to 267,913 sqft. Apart from 3 Tuas Ave 2, we note that there are seven other assets with redevelopment potential as their plot ratios have yet to be maximised. Judging by AA REIT’s track record, we believe that it will likely pursue complete redevelopment opportunities in favour of a more resilient, higher-spec portfolio – including data centres (if feasible), as opposed to incremental GFA via asset-enhancement initiatives. 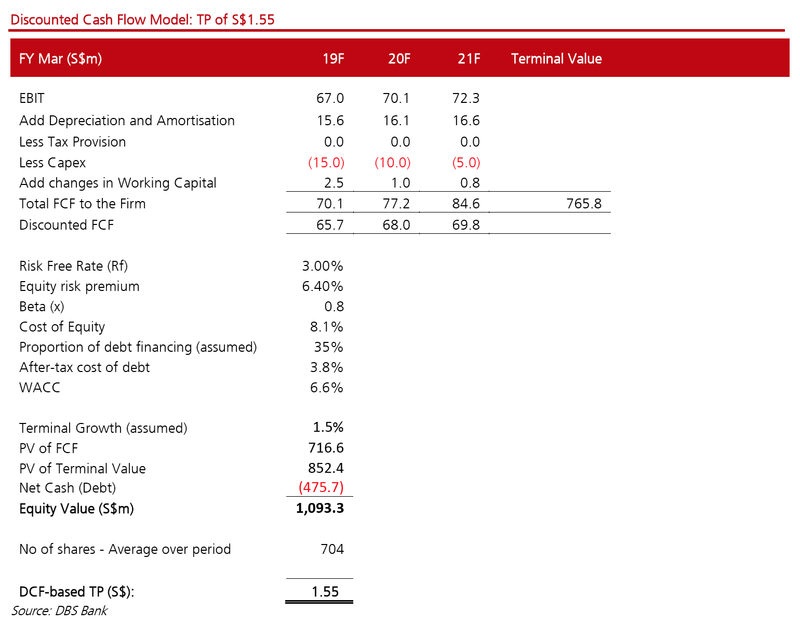 Assuming the plot ratio is maximised to include over 600,000 sqft (including 3 Tuas Ave 2) of unutilised GFA, higher rents post redevelopment and constant NPI margin of 70% and cap rate of 6.25-6.5%, respectively, we estimate that AA REIT’s RNAV would be S$1,013 – or +7.9% vs the Trust’s reported NAV of S$939m as at end-FY18. We have yet to factor in upside from these seven prospective sites into our estimates and Target Price of S$1.55. Value creation through greenfield projects. AA REIT embarked on its first third-party greenfield build-to-suit development project at 51 Marsiling Road in August 2016. Including land cost, the five-storey industrial facility cost approximately S$34.9m to construct and was recently valued at S$43m on 31 Mar 2018 after achieving TOP status on 27 Oct 2017. It is fully leased to manufacturer, Beyonics International Pte Ltd for a term of ten years with rent escalations built in. This will provide AA REIT with an estimated net property income of S$3.5m in the first year (FY19), which implies a relatively high cap rate of 8.1%. Based on development cost, NPI yield would have been 10%. Higher rents aside, we believe that this milestone project reflects AA REIT’s strong development capabilities – underscoring its strategy of seeking yield-accretive investments and commitment towards maximising unitholder value – and adds to its track record of redevelopments. Current gearing levels leaves headroom for further yield-accretive opportunities ahead. AA REIT’s aggregate leverage (A/L) stood at 33.5% as at 31 Mar 2018. Taking into account funding requirements for the redevelopment of 3 Tuas Avenue 2, its proforma leverage is expected to be 35%. Still below the regulatory gearing limit of 45%, we believe that there remains capacity for management to utilise its debt headroom for further redevelopment/ greenfield projects or acquisitions. Hunt for quality assets could spark offers from potential acquirers. The proposed merger & acquisition (M&A) between ESR REIT and Viva Industrial Trust puts the spotlight on the mid-cap industrial REITs (like AA REIT) that have been struggling to grow meaningfully through acquisitions as the combined entity will empower the REIT with greater diversification, liquidity and hopefully a lower cost of capital. Given the widely-anticipated consolidation of industrial REITs, we believe that AA REIT could potentially be a target, given its focus on the high-quality business parks space and modern ramp-up facilities. 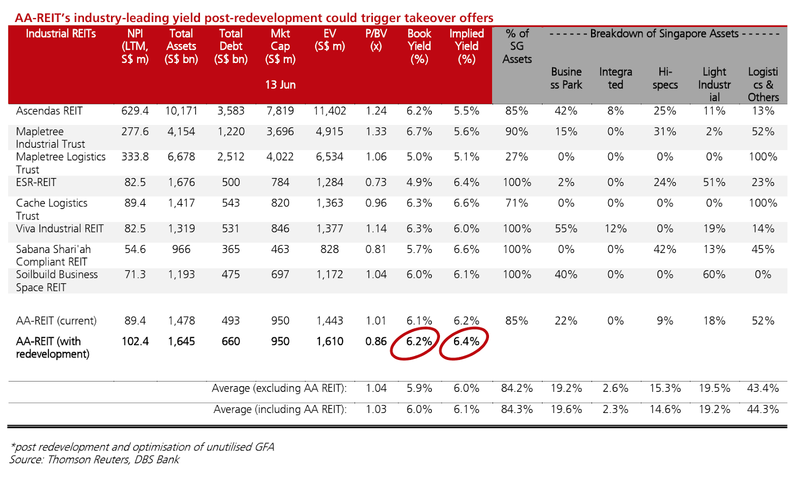 In our estimation, the REIT currently trades at an implied yield of 6.2% which could potentially grow to 6.4% (assuming 100% debt funded) if we include the development of its unutilised GFA. This will place AA REIT at the upper end of its peer range of 5.1%-6.6%. Approximately 37.7% of AA REIT’s GRI (from nine of its 26 properties) is backed by master leases to reputable tenants across diverse end-sectors. However, while master leases with built-in rent escalations provide stability with visibility on growth, adverse changes to the master tenants’ financial position or disruptions to their supply chain could result in the loss of rental income, which would have an impact on distributions to unitholders. Prolonged negative rental reversionary trends on weaker-than-expected economic outlook. With supply outstripping demand and the ongoing flight towards higher-quality assets, market vacancy rates have been on a downtrend since 2017 – resulting in negative rental reversions. While the narrowing supply-demand gap in 2018 and expectations of net absorption turning positive in 2019 bode well for rental and occupancy rates in the medium term, the anticipated recovery could be derailed by a slowdown in the global economy given the strong correlation between GDP and demand for industrial real estate historically. Concerns over longevity of returns given short land leases in the industrial space. Industrial spaces in Singapore have been characterised by shorter underlying land lease tenures of 30 years vs largely freehold sites in Australia and Europe. While the shorter leases provide investors with a higher yield premium, the decaying nature of such properties could weigh on future valuations and income. Competition from other industrial facilities. Between 18% and 23.6% of AA REIT’s underlying leases are due to expire annually over FY19F-21F. If competing properties become more successful in attracting and retaining tenants or are refurbished with newer facilities, the REIT may face difficulty in renewals and maintaining occupancy, which could adversely affect cash flow and ultimately distributions to unitholders. Rising rate environments are often perceived to be negative for REITs. However, we believe that that the impact of rising rates on distributions is largely mitigated, as AA REIT has hedged 88.1% (vs 84.4% a year ago) of its interest costs into fixed rates. The active diversification of funding sources should also help to ease concerns. Initiate with BUY and DCF-based Target Price of S$1.55. Supported by healthy occupancies across its cash-generative industrial assets – approximately 24% of FY19F GRI is backed by master leases with rental escalations of 1-3% p.a., we opine that the discounting of AA REIT’s cash flows would be an appropriate valuation metric. Our DCF model has factored in a normalised risk-free rate of 3%, market return of 6.4%, beta of 0.8x, target gearing of 35% and debt cost of 3.8% (which translates to WACC of 6.6%). Coupled with a terminal growth rate of 1.5%, we arrive at an equity value of S$1,093.3m and Target Price of S$1.55. AA REIT’s current share price implies yields of 7.4% for FY19F-20F, which is above the sector average of 6.9%-7%. We have yet to impute the potential development of available additional GFA in our estimates. Incorporating the full built-up of the portfolio GFA could lift our Target Price to S$1.65.